Vacation Read #3 was The Book Of Essie by Meghan MacLean Weir. Imagine a Duggar-like family, with an evangelical preacher father and strict, domineering mother, who is famous thanks to their hit reality TV show. When the book opens, the family has been on air for several seasons, and their 17 year-old daughter is pregnant, leaving the Hicks family facing the difficult decision of how to explain – or hide – it. Essie, meanwhile, is a smart young woman who is keenly aware of what’s going on around her and capable of manipulating the situation to serve her needs. She manages to go along with her mother’s plan for her to get married, identifying the boy she wants to marry while creating a situation that provides her the options she needs to survive. 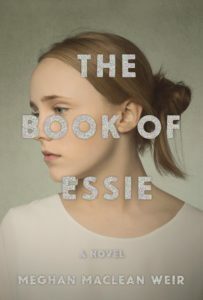 The Book Of Essie is suspenseful and insightful, lampooning reality TV and the hypocrisy of an evangelical family whose exterior hides an ugly reality. The ending is certainly convenient and perhaps contrived, but I still enjoyed the story and the question of how Essie was going to pull off her escape. There are a few secrets in the book that I managed to figure out pretty early, but it’s still a fast-paced and satisfying read. Posted on July 23, 2018 by gayle. This entry was posted in Fiction and tagged meghan maclean weir, the book of essie. Bookmark the permalink. I just finished this and loved it. The story was so compelling and there were so many likable characters. I also appreciated the vague echoes of recent historical events, not close enough to be strict parallels but similar enough to make me rethink how I viewed those events at the time. In particular, I was reminded of the Sarah Palin vice presidential run and the Ruby Ridge stand-off, but I’m sure the author drew upon other actual events that other readers would recognize as well.